Alison Roman is a food writer and recipe developer. She graciously (and deliciously) fed our guests at our housewarming dinner and, in celebration of her new cookbook (that makes her an author too!) she let us into her home whipped up this colorful carrot salad. Her cookbook, Dining In, was released this week and I’m obsessed (you should know now that I don’t use that word lightly). It’s funny, it’s real, it’s welcoming, and it’s beautiful – and filled with beautiful food. Below, a recipe from, and a conversation with, Alison. And if, or maybe when, you want more, you can pick up a copy of Dining In. How long have you been cooking and how / where did you learn? I have been cooking professionally for 12 years and amateur cooking (since I was a teenager) for 15 years. My mom was a great cook, so growing up it was always around me. My best friends’ mom was a great cook too. I ate there a lot and she made this pasta sauce that I became really obsessed with and wanted to learn how to make it so when I wasn’t at their house I could re-create it. Cooking was fun and something that I wanted to learn how to do but I didn’t think I was going to do it professionally, necessarily. In a few words, what’s your approach to food? I am generally unfussy and I don’t do anything or ask anyone to do anything unless it’s totally necessary and will make a difference. So I would say, unfussy. The most fun / rewarding part? I think feeding people is really fun and really rewarding, that’s kind of why I got into it. And it’s a really great way of seeing myself creatively, I don’t forget to explore the emotional connection of feeding people and cooking for myself. Also you get to eat really good food all the time! And it’s exactly how I want to eat- to be completely honest, that’s most fun part, eating what I want. What would your last meal be? Tell me everything. It would probably be pizza, if I could get the perfect slice. Or really good seafood with lemon and garlic and butter – I love that stuff! I had these grilled clams when I was in Portugal last week and they made me literally cry, they were SO good. So if it were to be my las meal, it would probably be those. Everyone’s been going to Portugal and now I see why- the food is really amazing and the people are awesome-just a really great place! This salad is a good exercise in the magic that can occur when you treat one ingredient very differently, in this case, as raw and roasted. It’s doing a lot with a little; caramelized, tender bits of carrots and fennel mingle with slices of their raw, crunchy former selves, and, well, there’s really nothing better. This salad is also terrific at room temperature and is easily doubled, making it great for feeding a crowd, so feel free to show off this little number at your next party or potluck. Slice half the fennel into ½-inch-thick wedges and place them on a rimmed baking sheet. If your carrots have tops, remove and set them aside. 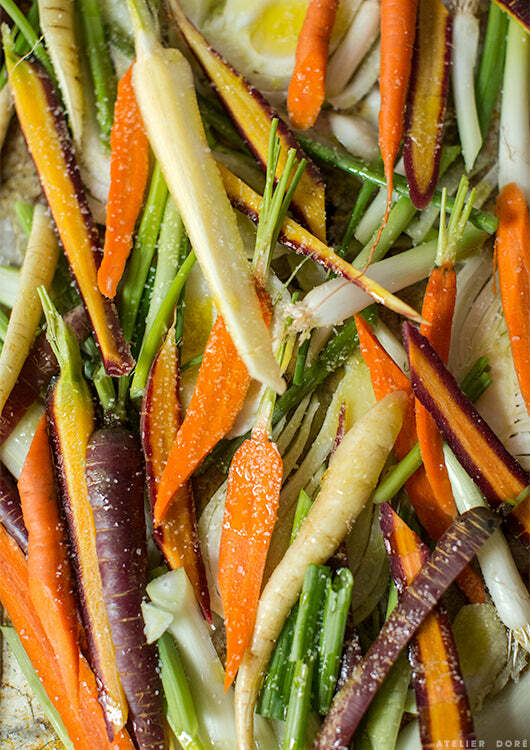 Scrub the carrots (no need to peel) and place half of them on the baking sheet with the fennel. Add half the scallions and toss with 3 tablespoons of the olive oil. Season with salt and pepper, and roast, tossing occasionally, until the carrots and fennel are browned and the scallions begin to char, 20 to 25 minutes. Remove them from the oven and let cool to room temperature. J’adore la premiere photo avec le chat ! “Le plus sympa c’est de pouvoir manger ce que je veux” tout a fait d’accord. wow, great interview! I love talking about food, I love reading about it and listening about it. And eat, obviously! Chaleureuse et souriante, ce livre à l’air vraiment chouette, un vrai bol d’air frais !! Wonderful interview! I have already made a couple delicious recipes from Alison’s cookbook and I’ve had it less than one week. I love the inventive ease of the recipes. Dining In is sure to become a frequently used cookbook in our house. Ah fennel… this is a dream dish. I love that it can be easily doubled to share with friends. Cooking is such a wonderful way to connect.